COLUMBIA — Bill Foster wanted out. It didn’t make sense. Foster built Duke back to a national power, trudging through three middling seasons until the payoff. That came in 1977-78, when his Blue Devils, led by Jim Spanarkel, Mike Gminski and fabulous freshmen Gene “Tinkerbell” Banks and Kenny “Dirty Dog” Dennard, stormed to the national championship game. A good but disappointing year in 1978-79 set the wheels in motion. Foster, a builder but not a maintainer, was beloved at Duke but didn’t feel he was. And as the rumors of South Carolina wanting him built through the 1979-80 season, Foster never did anything to quiet them. An ACC championship and an Elite Eight berth weren’t enough to get him to change his mind. Foster bolted to the Gamecocks, where he would have six years of heartache, and an actual heart attack. Ten days after Foster’s final game with the Blue Devils, Duke hired a branch of Bob Knight’s coaching tree that just finished a nine-win season at West Point. South Carolina opened the door for Mike Krzyzewski at Duke. Krzyzewski knew his history. 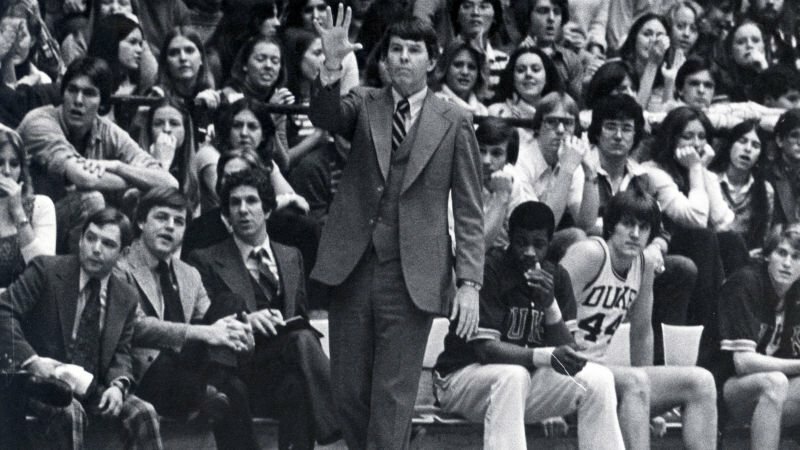 Bubas reached three Final Fours in four seasons at Duke, but the program slid under Bucky Waters after Bubas stepped into an administrative role. The Blue Devils were floundering. USC was flourishing. Frank McGuire’s New York pipeline created a 1969-70 team that won 25 games, a program-best that would stand for 47 years, and a 1970-71 team that won the coveted ACC title. Duke hired Foster after he built Bloomsburg State, Rutgers and Utah into solid programs. Meanwhile, the Gamecocks left the ACC and began life as an independent in 1971. McGuire didn’t care for it as it made it tougher for his teams to get into the NCAA Tournament, but was forced to live with it. USC won but had no tournament appearances under McGuire after 1974. Duke, under Foster, scuffled until it made its Final Four run in 1978. According to John Feinstein’s book on Foster's Blue Devils, “Forever’s Team,” the whispers of Foster replacing McGuire were building to a crescendo by December 1979. Foster didn’t feel appreciated by the Duke brass or the majority of basketball fans in North Carolina, who worshipped Dean Smith. Wenzel said the idea of going to USC, of starting fresh as an independent, of building another program, really rooted in February 1980. “I realized that it would have been out of character for him to stay,” he told Feinstein. Yet Duke unexpectedly won the ACC tournament, creating an emotional tug in Foster. How could he leave after his players gave him everything they had and bounced back after a poor end to the regular season? But athletic director Tom Butters wanted a decision. Foster wouldn’t go back on a verbal agreement with USC AD Jim Carlen, resigned at Duke with the understanding he could coach through the NCAA Tournament, and was introduced at USC the next day. Foster’s first team of McGuire leftovers won 17 games, then dropped to 14-15. But in 1982, the Gamecocks had a strong team. During a win over Purdue in December, Foster began feeling shaky. As he lay down trying to get comfortable, an ambulance was called. Foster was having a heart attack. He missed the next 17 games. USC went 22-9 that season, by far the best of his USC tenure, but without a league to call home, the Gamecocks were relegated to the NIT (USC joined the Metro Conference the next season). By 1986, Foster and athletic director Bob Marcum had gotten sideways, an NCAA investigation in 1987 concluding that several of Foster’s players sold their game tickets, received free meals and were loaned cars. Foster was fired on March 8, 1986. Twenty-three days later, Krzyzewski coached his first great Duke team in the national championship game. Foster died in January 2016. He coached at Northwestern after USC, never able to replicate the success he had at Duke. There were still regrets of how it ended, even when Feinstein published his book in 1989. USC never replicated its success under McGuire, making a mere five NCAA Tournament appearances after he was forced out in 1980. Yet its last trip, in 2017, resulted in the program’s lone Final Four appearance, one in which it beat Krzyzewski and Duke in the NCAA Tournament. Krzyzewski, winner of more games than any college coach on any level and having 12 Final Fours and five national championships to his credit, sat at USC’s arena just down the hall from where a picture hangs immortalizing the Gamecocks’ Final Four run. He was three days past the 39th anniversary of his hiring at Duke. Maybe if Foster and Butters had talked about why Foster felt so unloved. Maybe if McGuire hadn’t been shoved out. Maybe if Carlen didn’t set his sights on Foster. Maybe McGuire retires on his own time, Foster keeps his Duke tenure successful and USC is looking for a young up-and-comer. Maybe Krzyzewski has another nice year or two at West Point and then his name is on the radar of another Southern school with an ACC pedigree. Maybe Krzyzewski is at Colonial Life Arena this weekend as more than a visitor.